The Bronson Pinchot Project Premieres! This is it, tonight at 10:30 pm ET, The Bronson Pinchot Project premieres officially! The show will air regurlarly from now on every Saturday at 10:30 pm and at 1:30 am ET on the DIY Network. A LOT more links to audio and video interviews coming soon! Previous PostIt’s Today!Next PostInterviews Galore! This was one of the most interesting, charming, and informative shows that I have seen in years. Thanks Mr. Pinchot for allowing us into your world. Looking forward to seeing your show tonight. I am also working on refurbishing a house in a small town in PA! Check out “Mount Gretna” sometime…this is where my house is and they have a wonderful outdoor summer theater there! Best wishes! Loved the show. It was GREAT! Informative, charming, entertaining, funny and beautiful. Your love of architecture and historical pieces comes through loud and clear. Looking forward to more episodes. I used to live in Harford for a short period of time and I remember walking my dogs past the property and seeing Bronson outside working on the property. Everyone I spoke to had a negative view of what Bronson was going to do to the town. 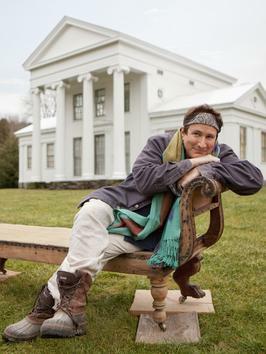 It is very clear from watching The Bronson Pinchot Project that he has no ill intentions and just really wants to bring old structures to life. I love watching the show because it brings me back to the country, quiet and beautiful landscape that Harford, PA represents. Keep filming and bringing these great structures back to life! LOVE the show! The pics of the Decker house all illuminated in the evening light are just beautiful. Also love the pic of the statue. (minus her HEAD) …. the way the light just caressesII her beautiful shot. While watching the show I wasn’t sure about the large elements in smaller rooms.. but looks beautiful!! !